This is the facade of the school where I took up my Bachelor's Degree in Accountancy and subsequently my Bachelor's in Liberal Law. I love this school. This school gave me so much honors. The school paraded and honored me when I passed the CPA Board Exam. Then, the school gave me recognition by awarding me as their most outstanding alumnus in 2005 for the College of Commerce. That is why to reciprocate from what they have done to me, I try to exemplify and be a role model of the graduates of this University. Hi I have studied also in Araullo but that was during the Esteban era. Its nice to know that the school has improved so much now. HELLO LAWSTUDE, ITS NICE TO KNOW YOUR PLACE BUT YOU SEE I AM A LAW STUDENT ALSO AND I MISS YOUR POSTS ABOUT LAW TOPICS. WHEN WILL THE OLD LAWSTUDE RETURN? 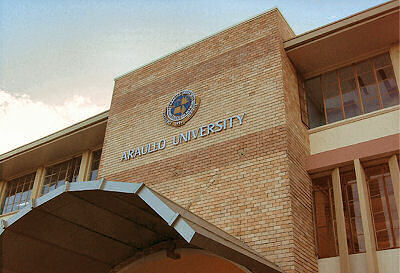 anony 1 : yeah, Araullo University is now part of the PHINMA Education Network. anony 2 : Araullo is in Cabanatuan City. anony 3 : The old lawstude is just taking a breather from law topics. Don't you worry, i will post law lectures especially those given in our BAR exam. Also, I have been reading the case of Lambino vs COMELEC, so i will post a digest of the case hopefully within this week. it's nice to see a smile on your face after all those blood pumping reviews and finally the much awaited exam. you're great.two thumbs up sir! i'm studying now in Araullo University taking up BS Nursing and i can say that tyhe school has improved a lot! I have attended Araullo University and have won a title of Miss Araullo. I have not seen Araullo since I migrated in US. I won't be surprise if my former friends and classmates still hangs out in the student body office. am just an ordinary pipol...wanting to know more about the world of Law,,,hope to be one of them.